Abstract: Active volcanoes are complex natural systems that deliver high-temperature molten rock to the Earth’s surface from great depths in sometimes spectacular and deadly fashion. Many factors determine what form the resulting eruptive activity will take, ranging from a passive effusion of lava to cataclysmic explosions that can go on for hours or days and launch vast quantities of rock particles high into the stratosphere. Uncertainty surrounds the time prior to eruption onset as volcanologists try to determine not only whether or when an eruption will begin, but the style and magnitude the eruption may attain. Add to these physical uncertainties the human elements of residential populations, critical infrastructure, economic interests, etc., and a volcanic system threatening eruption can easily and quickly become a crisis. Once an eruption is underway, a wide variety of hazards can occur, varying in time and distance from the eruption source. The United States has within its territory approximately 170 active and potentially active volcanoes (about 11% of the global total) in a variety of geographic settings. The U.S. Geological Survey’s Volcano Science Center operates 5 U.S. volcano observatories that monitor activity, assess hazards, and conduct research on the U.S. volcanoes. In cooperation with the U.S. Agency for International Development, the USGS also operates the Volcano Disaster Assistance Program (VDAP) which responds to foreign volcano crises, provides training and consultation with foreign counterparts, develops monitoring infrastructure, and assesses volcano hazards in other countries. Since 1980, USGS volcano observatories have responded to 115 eruptions and 51 episodes of notable volcanic unrest at 44 U.S. volcanoes. Most of these episodes occurred in Alaska, but the conterminous U.S., Hawaii, and the Commonwealth of the Northern Mariana Islands all have hosted eruptive activity. Recent U.S. eruptions cost human lives, disrupted en route aviation, destroyed homes and infrastructure, and caused billions of dollars in damage. In its 30 years of operation, VDAP has responded to more than 25 major volcano crises, helping counterpart agencies save tens of thousands of lives. VDAP has also fostered the growth and stability of volcano observatories in more than 12 countries, installing monitoring systems, providing computer systems and software, and training staff on a variety of monitoring techniques. Highlights of eruption responses at volcanoes such as Mount St. Helens and Mount Redoubt, USA, and Mount Pinatubo, Philippines will be covered in the presentation. Bio: John Ewert is a geologist with the U.S. Geological Survey, stationed at the Cascades Volcano Observatory in Vancouver, WA, and specializing in volcano hazards mitigation in the United States and around the Pacific Rim. From 1980 to 1986 he worked at Mount St. Helens monitoring and researching eruptive activity there as well as working on projects at other Cascade Range volcanoes. 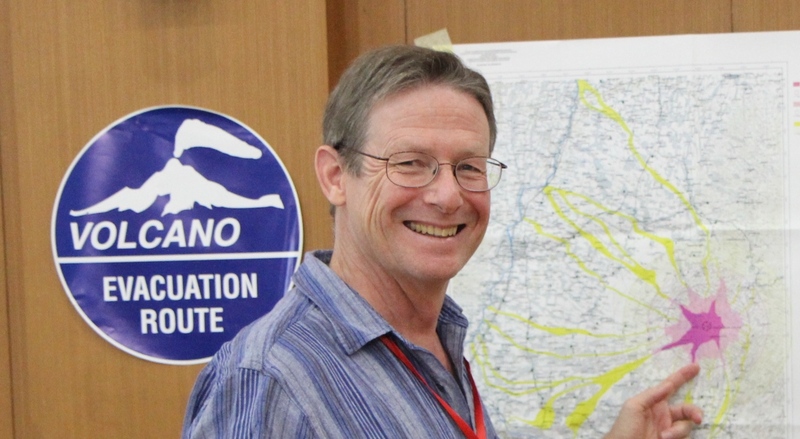 In 1986 he was one of the founding members of the ongoing USAID-USGS Volcano Disaster Assistance Program (VDAP) and worked in VDAP from 1986-2010 responding to volcanic eruption crises and developing volcano monitoring infrastructure in Latin America, the southwest Pacific and Southeast Asia. In addition to responsibilities with VDAP, in 2005 Mr. Ewert was part of the team that developed the National Volcano Early Warning System (NVEWS) initiative which is being used to guide long-term improvements to the Nation’s volcano-monitoring infrastructure operated by the USGS and affiliated. From 2010 to 2015 Mr. Ewert served as the Scientist-in-Charge of the Cascades Volcano Observatory and has recently returned to VDAP and NVEWS projects.